Is there anything redeeming about matzah? It is literally the bread of affliction, for god's sake. It has weird bumpy bits and no taste, and could stop up Niagara Falls, let alone a single, sad tummy. I cannot with matzah pizza, or matzah lasagna, or any matzah version of a normally glorious chametz-filled food. I can be tempted by matzah covered in butter and cheese, but only in tiny doses. I learned a while ago that there are people who not only enjoy matzah on Passover, but all year round! Like, they go to the store in October, think "man, I could really go for some matzah right now" and then they BUY IT AND EAT IT AS IF IT IS THE MOST NORMAL THING IN THE WORLD. Maybe it tastes better if you've never had to survive on it for eight days a year? I don't know. I'm not going to yuck your yum if you're a year-round matzah eater, but please explain yourself in the comments. And if it was topped with a layer of crushed potato chips? I would eat it every damn day. "Um, Rina? You do know you now have two recipes with crack in the title, right? Should we be concerned?" Not at all! This recipe is just THAT addicting. And fortunately for you, you can't smoke it! Well, I guess you could, but don't do that. Please, god, don't do that. ANYWAY, traditional matzah crack is made with a layer of matzah, a layer of toffee and a layer of melted chocolate. We went one step further and covered ours in crushed potato chips, and we didn't even do any crack when we thought of it. This recipe takes no time at all and is great to gift or to keep for yourself. It's salty, sweet, crunchy and perfect. Oh, and there are plenty of brands of potato chips that are explicitly marked as kosher for Passover if applicable. Happy snacking, and happy almost Passover! *We used about half of the largest bag of chips you can get in the average NYC grocery store, which is about 9 ounces. Prep: preheat the oven to 350F and line an 11x17 baking tray (or the largest one you have) with foil, followed by a layer of parchment paper. Line the tray with as many sheets of matzah that will fit, breaking them into parts if necessary. As Deb at smitten kitchen notes, matzah doesn't like to break in straight lines, so don't worry if you get some seriously craggy bits. Make the toffee: in a medium heavy-bottomed saucepan, melt the butter and brown sugar, stirring over medium heat until it begins to boil. Once it's boiling, cook for 3 more minutes while stirring - it'll thicken a bit. Remove from the heat, immediately add the salt and vanilla and mix to incorporate. 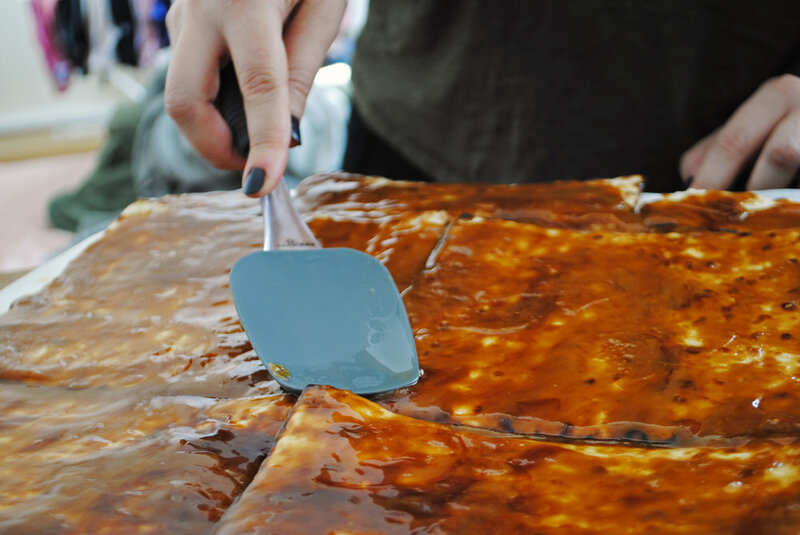 Pour over the matzah sheets and spread quickly - the toffee starts to set right when it leaves the saucepan. Bake: put the matzah in the oven for 10 minutes, watching carefully to make sure that it doesn't start to burn. Ours didn't need more time than this, but yours may need a few more minutes to go a truly golden toasty color. Watch out for edges and corners that darken too quickly or start to burn. Add the chocolate and chips: place the tray on a cooling rack or trivet and immediately sprinkle with the chocolate chips. Allow to stand for five minutes, then spread evenly with an offset spatula (a normal spatula is fine, too). Sprinkle the crushed potato chips over the chocolate, pressing them in if necessary. Allow to cool completely (on the counter or fridge), then break into pieces and store in a container or zippered plastic bag. It should keep for up to 1 week, but good luck with that.